Part one of my journey is complete! I challenged myself to play through all the Pokemon regions before Sun and Moon come out in November. I played Pokemon Blue, starting at the very roots of the series. I have officially made it through the Kanto region. How I got the game: I have the Gameboy cartridge, but I downloaded the game from the 3DS’s Nintendo E-Shop. 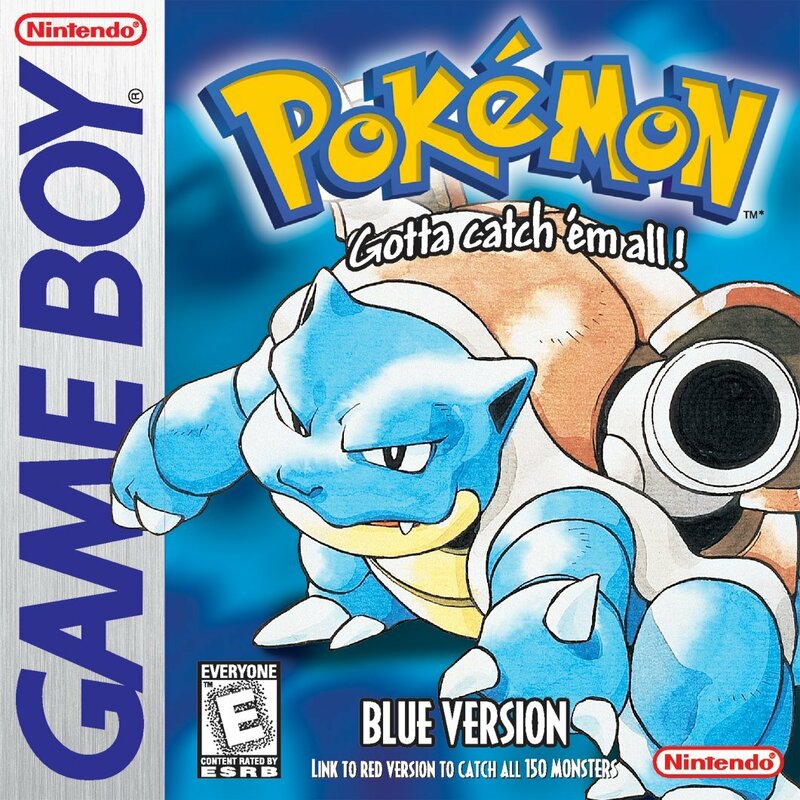 I was only two-years-old when Pokemon Blue first came out for the Gameboy in February 1996. I always watched Kris play the games, but by the time I was ready to play them myself (not that I was any good at it) Pokemon Gold and Silver had already come out in November 1999. I started in the Johto region and while I’ve played FireRed and LeafGreen, I always wanted to play the games from the very beginning. Considering the game came out in early 1996, the graphics aren’t that bad. The actual layout of each town and route looks the same as the other games, more or less, other than being in black and white. The sprites of the Pokemon are… interesting, to say the least. Most of the Pokemon look creepy or they’re really fat or they’re abnormally large. But it’s fun to play in such an old school setting. Pokemon music is the best. Listening to nostalgic Pokemon music is even better. Unless it’s Lavender Town. The controls in this game are definitely different compared to the controls in the newer games. For example, instead of just standing in front of a tree and pressing the “A” button, you have to stand in front of the tree, open the menu, click Pokemon, then find the Pokemon who knows the move Cut. Then tell them to use it. There’s a lot of unnecessary steps. There’s a limited amount of items you can hold at one time. I had no idea that was a thing. You don’t know how many people yelled at me when they tried to give me things. Also… The walking. I don’t know how people used to play the games without the running shoes. Like every other Pokemon game, you play the “hero.” While trying to “catch them all” and “be the very best” you must save the entire world and the whole Pokemon species from Team Rocket. Which is not something you signed up for. This game is hard. I remember it took me about 24 hours (or something around there) to complete Pokemon X. When I hit 24 hours on Pokemon Blue I was just going up against the sixth gym badge in Fushia City. I didn’t realize how much grinding there needed to be before and after the first gym badge. In between the other badges, there was enough trainers and side story to level up, but I think it took me five hours alone just to get to the first gym. Whether that’s normal or just me, I don’t know. I know this is the first game in the series, but this is a great starting point for people who are just starting out on Pokemon. There are no abilities, no genders–therefore no breeding–trading isn’t as easy and common as it is now… All you really need to know are the types of the Pokemon and the move types. And, if you’re new to Pokemon, that can take a while to learn. I still forget sometimes and I’ve been playing these games for most of my life. Either way, it was great to start at the roots of the Pokemon series. I feel accomplished that I have finally played through the very first game of the Kanto region. As many of you know, I’ve been doing a playthrough of the Pokemon games in order by the regions. Since I played Pokemon Blue this month, I thought I would share my favorite Kanto Pokemon. Gengar is cool. All of his evolutions are. I also think Gengar is pretty cute. Creepy, but I’m sure if you get to know him, he’s pretty cute. Tell me who doesn’t love Eevee. When I was younger, I had a fascination with Oddish. I don’t really know why, but Oddish is adorable. So that’s good enough reason. People don’t give Psyduck nearly enough credit. Fire is my favorite type so Charmander is always my go-to guy. He’s adorable, powerful, and I just can’t get enough of him. What are you favorite Pokemon from the Kanto region? The month of June has flown by! So it’s time for an update on my Pokemon Playthrough. I decided to play through each Pokemon region for each month leading up to the release of Pokemon Sun and Moon. Starting with Kanto, I’ve been playing Pokemon Blue since the beginning of June. The weather is so beautiful that I’ve been sitting outside to read. I tried to bring my 3DS outside, but I couldn’t see the screen. I’ve been playing other games. I’ve had other work to do such as blogging or writing. June is always a busy month with birthdays, end of the school year activities, Father’s Day, etc. I thought I had more time until I realized the other day that June is just about over. Why am I giving you guys a list of excuses? Well, I was supposed to give you an update on where I am in Pokemon Blue. When I decided to do an update for it I thought I would at least be halfway done with the game. I just got to Cerulean City. And by that I mean I just got to that city yesterday. And by that I mean I just got my first gym badge yesterday. Yes. I’m a little slow, I know. I am determined to beat the game by the end of the month. I still have another week and a half and things are beginning to settle down. I’m sure I’ll be able to find the time to play Pokemon. So that’s where I stand with the game so far. Do you think I can make it to the end by the end of the month?